What truly differentiates doctors of chiropractic from any other healthcare professionals is the fact that chiropractors are the only professionals who are trained to diagnose and treat what are called spinal subluxations. The word “subluxation” comes from the Latin words meaning “somewhat or slight" (sub) and “to dislocate” (luxare). So the term ‘vertebral subluxation’ literally means a slight dislocation or misalignment of the bones in the spine. sometimes shocks people a little bit the first couple times they get adjusted, but the sensation is usually relieving. Occasionally, minor discomfort is experienced, especially if the surrounding muscles are in spasm or the patient tenses up during the chiropractic procedure. There are times when the audible “cracking” does not occur. This is often due to either significant muscle tightness or that the patient may be having a hard time relaxing during their adjustments. However, the chiropractic adjustment is still important. The leak is fixed. The wiring is fixed. Information is flowing again. To keep the wiring fixed and the information flowing, several adjustments over a course of time may be necessary, in addition to massage, physical therapy, stretching exercises, or strengthening exercises. In the chiropractic world, keeping the problem fixed and preventing its reoccurrence is just as important as the initial remedy. 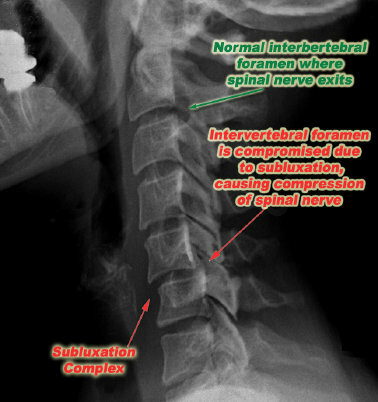 How do You Correct the Subluxation?